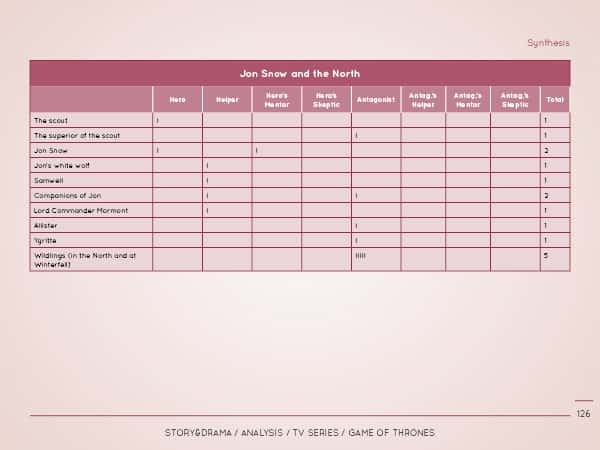 What makes Game of Thrones the most watched series in the world ? Probably the great quality of its scenario. A vast, complex narrative architecture. Hundreds of realistic, colorful, contrasted characters. 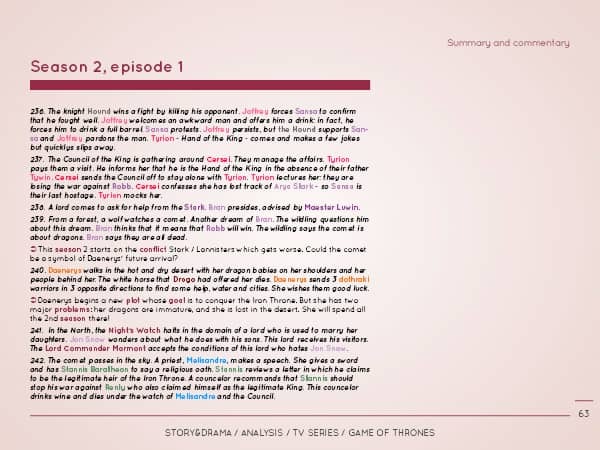 Here is the complete scenario analysis of the 20 first episodes of the queen of the series. Ed Stark visits the corpse of Hugh of the Vale and discusses with the Lord Commander. Stark then visits King Robert who got so fat that he can not put his armour on any more, and he insults his squire Lancel Lannister. Robert wants to take part to the tournament but Ed Stark is against since everybody would let him win. Robert who was thoughtlessly going to go out half naked laughs in self-derision and mocks his people. At the tournament, Stark is sitting next to Sansa. The Knight of the Flowers gives Sansa a rose, greets Stark and his opponant, “The Mountain”. Littlefinger bets on the Mountain. The knights ride, the Knight of the Flowers sends the Mountain off the ground. Littlefinger understands that the horse of the Mountain was in heat and suspects some cheating from the Knight of the Flowers. The Mountain attacks the Knight, but the Hound comes to fight his brother, and the King splits them. Tyrion is prisoner of Catelyn, on the road back to Winterfell. He tries to convince her that he never wanted to kill Bran. They are suddenly attacked by bandits. They fight and kill the bandits. Even Tyrion, freed by Catelyn, kills one. He is congratulated by the knight Bronn. We develop the plot started in the end of episode 4. Maester Luwin schools Bran: he makes him learn the mottos of the main families of the realm. Bran can not tell the one of the Lannisters. Bran is angry at his absent mother. Maester Luwin suggests Bran to learn shooting arrows from a horse. Theon Greyjoy fucks a prostitute, then they discuss. Theon questions her about another of her customers: Tyrion. Theon seems jealous of his high rank. Theon is again a secondary character. Only later will he take a more important dimension. Arya, in the castle corridors, is trying to catch cats. Exposition of a mini-plot “Arya witness”. Lord Varys receives Stark. He warns that King Robert is in danger to be poisoned as was his previous Hand Jon Arryn. They evoke the death of Sir Hugh of the Vale, fallen during the tournament: squire of the previous Hand, he poured the poison. Why killing Jon Arryn? Because he was too curious. Here, we do not know who is telling the truth. Maester Pycelle told Stark that Varys had poisoned Jon Arryn. Now Varys is telling us that Hugh of the Vale did it, and since he just died, Stark has no way to know the truth. which maintains the suspense. Arya trains in the corridors of the crypt. Hearing voices, she hides. 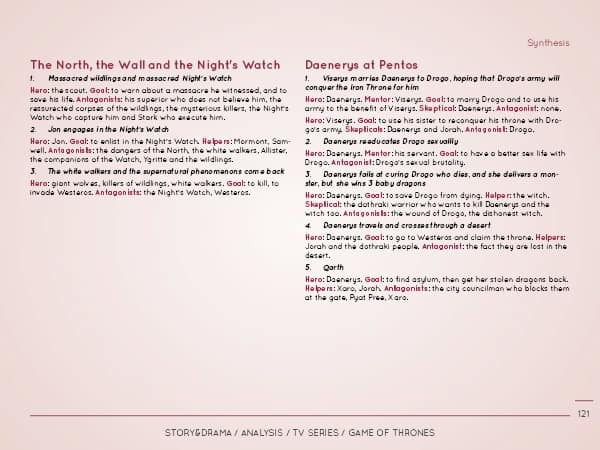 Varys arrives with Illyrio who is in charge of watching Daenerys and Viserys in Pentos: they conspire, evoke the assassination of Stark and the fact that Drogo is expecting the birth of his first son to move to the attack. Development of the mini-plot “Arya witness”. Littlefinger contemplates the Iron Throne. Lord Varys joins him. They face each other with hostility. Varys criticizes Littlefinger of being too close to the Stark. Littlefinger answers back and reproaches Varys for plotting in Pentos. Renly Baratheon interrupts them and tells them that King Robert is coming. Arya is all alone. She wants to enter the castle. She is stopped by 2 royal guards who mistake her for a beggar. She finally arrives in front of her worried father. A man of the Night’s Watch comes to visit Stark to inform him that his wife has arrested Tyrion Lannister. Catelyn and Tyrion are stopped in the surroundings of the castle of Lysa Arryn. Men in arms accompany and monitor them up to the castle. Obstacle in the sub-plot “Tyrion prisoner of Catelyn”, which gets double: Tyrion Hero of his travel met Catelyn as his Antagonist; now Catelyn Hero of “Catelyn makes Tyrion prisoner” meets her sister as Antagonist. Stark and King Robert confront opposite opinions in front of the Council. Robert wants to kill Daenerys, pregnant according to their informer Jorah Mormont. Robert insults Stark. Varys agrees with the King. Littlefinger and Maester Pycelle too. But Stark refuses to kill a woman and her child. Robert threatens Stark who resigns his Hand of the King. Stark is packing, Littlefinger interrupts him and proposes him to visit the last person who saw Jon Arryn. Stark follows Littlefinger after having commanded a knight to protect his two daughters. In the castle of her sister, Queen Lysa Arryn and her son who is still breastfed welcome Catelyn. Lysa is angry at Tyrion: she accuses him of having killed her husband Jon Arryn. Lysa and her son want to keep Tyrion. Catelyn objects: he is her personal prisoner, but Lysa puts him in her gaols. It confirms the characters of the plot “Catelyn makes Tyrion prisoner”: Catelyn Hero, her sister Lysa Antagonist. Did you enjoy Game of Thrones? Do you want to know how it was written? 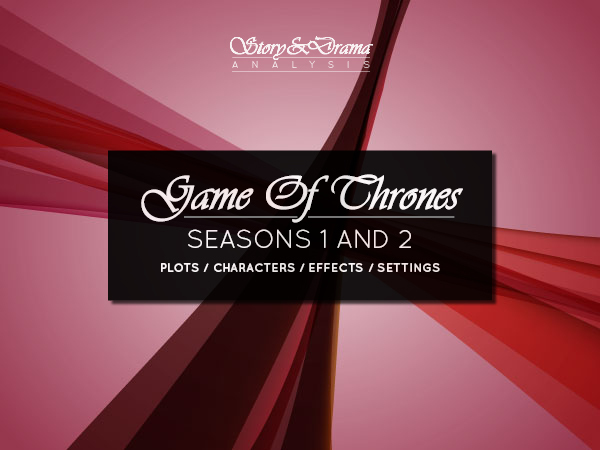 Then read our full analysis of Game of Thrones seasons 1 & 2 and improve your scriptwriting skills!